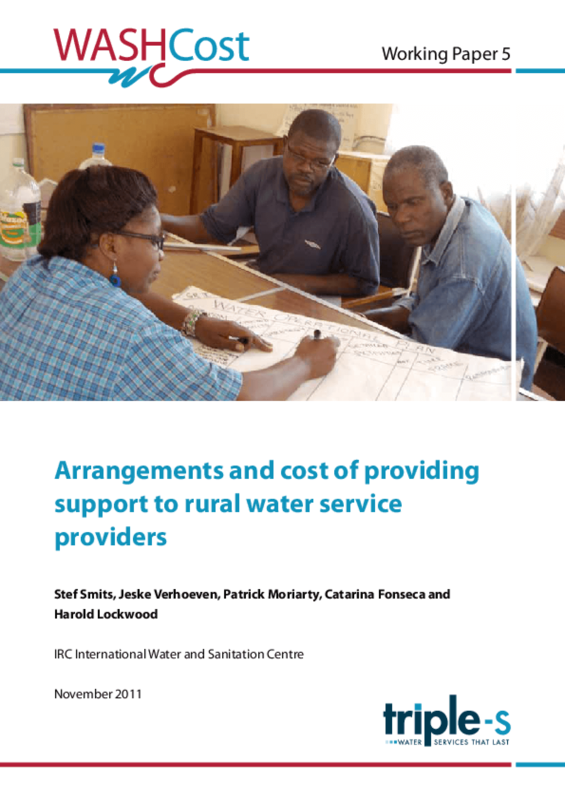 This paper is about the costs of providing direct and indirect support to rural water service provision. It provides an overview of the features such support entails, how these features can be organized, what they cost and how they can be financed. It also provides recommendations to countries for strengthening support. The paper is based on a desk review of existing literature from seven countries and an analysis of primary cost data collected by the WASHCost project in Andhra Pradesh (India), Mozambique and Ghana in 2010 and 2011. Support to service providers in the form of monitoring, technical assistance and (re)training of service providers is called direct support whereas indirect support refers to aspects such as macro-level planning and policy making. Direct support can be provided in different forms: by specialized agencies, by local government or even by an association of service providers. However, the nature, scope and frequency of such support are often not sufficiently defined. There is, therefore, still little quantitative evidence that supports the premise that direct support has a positive impact on the quality and sustainability of services.